"His words, his deeds and his life." A journey through the eventful life of APJ Abdul Kalam gathered from his thought- provoking and inspiring words. "Failure will never overtake me if my determination to succeed is strong enough"
The way he went about his tasks and responsibilities, be it creating the missile technology for his country or just inspiring millions of young Indians, his life is an example for how a strong determination can lead to success. "Don't take rest after your first victory because if you fail in the second, more lips are waiting to say that your first victory was just luck." He is a man who never rested on his laurels and practical that he was, he explained how the world filled with jealousy would always have something to say to the winners. His ideas and his approach to his winning ways are simple yet profound in its effectiveness and strongly rooted in earnestness. "Man needs difficulties in life because they are necessary to enjoy the success." "If you want to shine like a sun. First burn like a sun." Having come from the most humble background and rising to the highest level in life has only made him even humbler which is just incredible. And the best thing is the way that he acknowledges his own unique self. "All of us do not have equal talent. But, all of us have an equal opportunity to develop our talents." The wise man is he who finds opportunity in every little thing that is overlooked by many and he really did that, be it in his life both inside and outside of rocket science lab. He always lived a life as a thinker, a most achieving scientist and as a most respected President of India, commanding respect from across the world for his noble thoughts and his simple words of wisdom. "Without your involvement you can't succeed. With your involvement you can't fail. " His commitment and dedication was paramount that resulted in his unmatched involvement in everything that he did. This has always been the mark of this great man who rose to the heights that very few men will, to hold the highest position in a nation. Never cease to dream and always believe in dreams, and this cannot even be said without taking this great man's life story as an example. Lived a life as witness to an 'incredible vision and determination', this man never did give up, what ever may be life's challenges. Stood the test of times, conquered the advancement in technology, cut across generations in a winning style with his lovable flair and emerged above all by winning over a billion hearts. "Unless India stands up to the world, no one will respect us. In this world, fear has no place. Only strength respects strength." His life was a journey that will be remembered for generations to come. 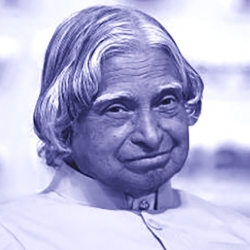 His mission to succeed put India as a respectable power in the world of rocket science and space technologies. His vision for the nation made him, without any doubt, the most loved and followed President of India. His approach in doing things earned him and India the respect of many nations across the globe. His dream was and is so beautiful that it triggered a billion minds to dream with their hearts for a better India. His words that are quoted above will remain etched in all of us, forever. This indeed is a noble soul that left an undeniably incredible and the most admirable Soulprint that will undoubtedly stay on and on, only to be celebrated.